From April 2014, 10th to 14th will be take place the fifth edition of the famous World Sauvignon Contest (Concours Mondial du Sauvignon). Event created in 2010 at the initiative of the ODG Bordeaux & Bordeaux Supérieur and Bernard Vincent global dimension to this competition aims to promote the white wines made ​​from this grape, the Sauvignon. The only requirement for inclusion is that the wine is produced with more of 51 % of Sauvignon grapes and / or Sauvignon Gris. This competition is designed to promote the wines from this grape, to inform the public about the richness and diversity of the world white Sauvignon, guide consumers but also to be a place of exchange, debate and enrichment of professionals of this market . 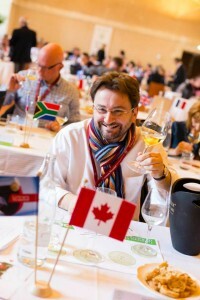 Last year more than 800 samples from 22 countries were tasted. The contest winner each year more notoriety this year the number of participants should be more important. For this 2014 edition of the World Sauvignon Master (Concours Mondial du Sauvignon) returns to its headquarters in Bordeaux. Wines in competition will be blind tasted by sixty tasters twenty nationalities (journalists, tasters renowned, wine merchants, winemakers, winegrowers, producers … etc). The results of the 2014 edition of the World Sauvignon Contest will be available on this blog after official publication. Last information, you will be able to taste the award winning wines on the evening of April 14 in Wine Bar of the CIVB.